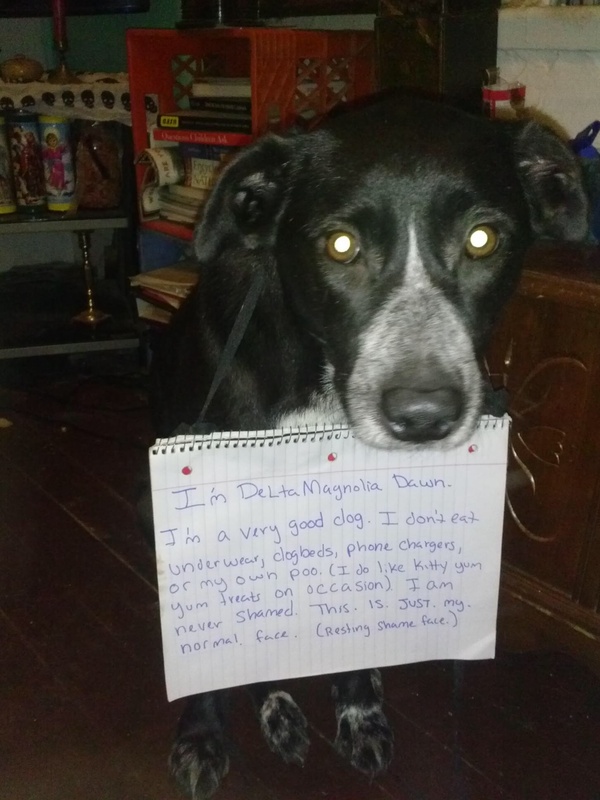 Delta Magnolia Dawn is a great dog, she never eats phone chargers, power cords, underwear, dog beds, shoes or garbage. She will dig in the cat box if given the opportunity…. But because she is special and in getting ready to have surgery, she gets away with it without being shamed. She was just born with resting shame face….which is precious. Posted February 25th, 2015 . Beautiful puppy. Any idea what breed she is? I have a little male rescue just like her. Uh… that made me cry. I hope your surgery goes well, you beautiful girl. What a sweetheart! Best wishes for a speedy recovery, Delta Magnolia Dawn! And a fine face it is. Hope she is okay. Looks like a sweetheart! What a sweet, pretty girl. Wishing her a speedy recovery and lots of hugs! Hugs and smooches sweet girl!!!! The face of innocence is too sweet.